A toll free number offers a big company image to clients and other callers who want to contact you free of charge from wherever they are located. 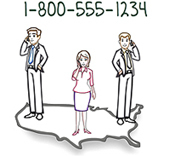 we offer a variety of toll free number types, from 800 and 866 extensions to vanity numbers. A local number can provide a local presence in any target city. Many clients use local numbers in geographical targeted advertising. We provide numbers for all major cities. These numbers can be forwarded to any numbers. 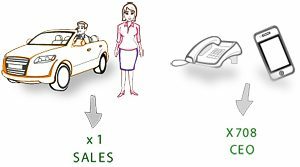 Create a professional image with a professional phone system that greets callers with a customized greeting, give them options such as press 1 for sales or 2 for customer service and route them to you by forwarding the call to one phone or all of your phones. Inform you through your callerid that it is a business call so you can answer the call professionally. If you don’t answer the call, it greets the caller with a professional voicemail and email you the voicemails so you can call them back. It also comes with a separate fax line as well as conferencing. A full package to give a professional image your business needs and deserves. 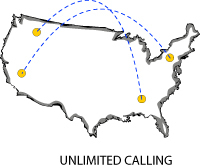 Forward calls to your Sound Bigger business phone system to any phone including your mobile, landline and/or Voip. You can forward the call to all of your phone numbers at the same time or one after the other. Calls can be programmed to ring to your mobile phone for two rings and then to ring your home for 3 rings and so on. It can also be programmed to ring all the numbers at the same time. You can answer the call at any of your phone. If you miss a call then it is sent to a professional voicemail system and the voicemails are emailed to you. This way you don’t miss a single call. To add a big company feel you can use a custom main greeting to inform callers of their options, such as accessing information or reaching a specific department. It can say ” Welcome to ABC company. Please press 1 for sales. 2 for Support etc. You can setup a specific extension for each department or each employee. Each extension can have specific message and voicemail delivery settings. Do you receive multiple incoming calls throughout the day? This feature allows your callers to never hear a busy signal. This feature allows to call up to 5 different phone numbers sequentially and you can answer in anyone of them. You can set up the phone to ring to your mobile phone, work phone and home phone. So you don’t have to worry about missing a call. This feature allows you to decide what you want to do with a call. You can answer a call, put it on hold, or send it to voicemail. You are also able to hear the callers phone number or name before you answer. The on-line account manager gives you full control over any PBX feature at any time. View all Call Details, change the routing, listen to voicemails and view account transactions as well as many other features. All details are posted in real time, and all account changes are modified in real time as well. This message delivery service sends voicemails in MP3 format directly to any e-mail address(es) that you choose.